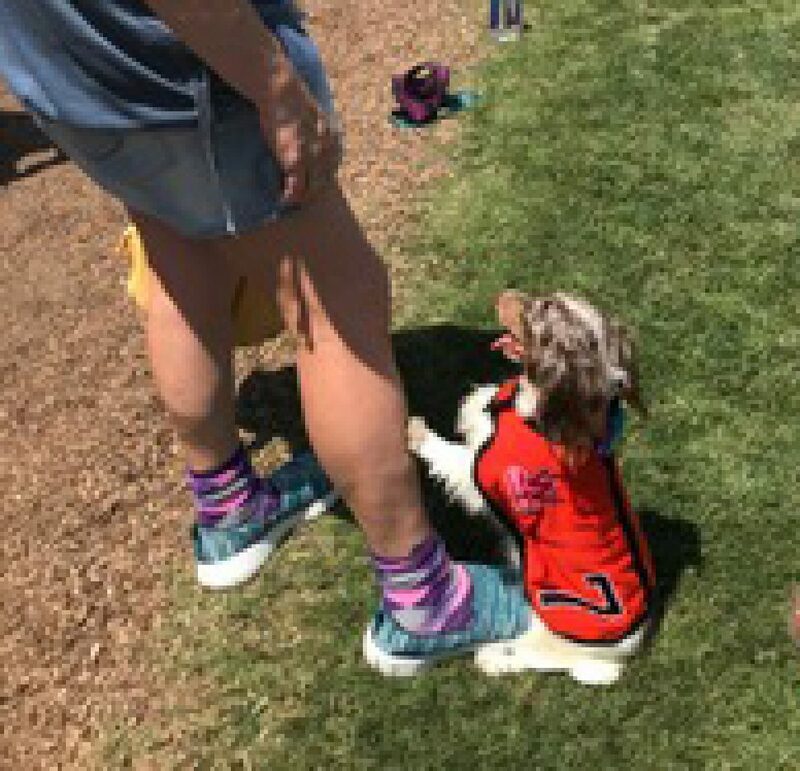 Aaaand away they go, to sniff at a bug or a piece of debris, head over to the wall of spectators and scamper between legs, skitter after a hapless bird, or barrel toward their human, except not mama Francine at the finish line but dad Sammy and the siblings on the sidelines. And curiously enough, one of them will win the heat (an unfortunate term for a doggie race, but so be it, and there are 10 of them and a championship one to boot). Speaking of heat…Wienerschnitzel’s mascot’s expression looks like a comment on Monday’s temperature. Photo by Kate Karp. What could be more giggleworthy than a field full of dachshunds at a race track, clad in racing colors, tripping over their little legs to do whatever they please or trying to please their humans? 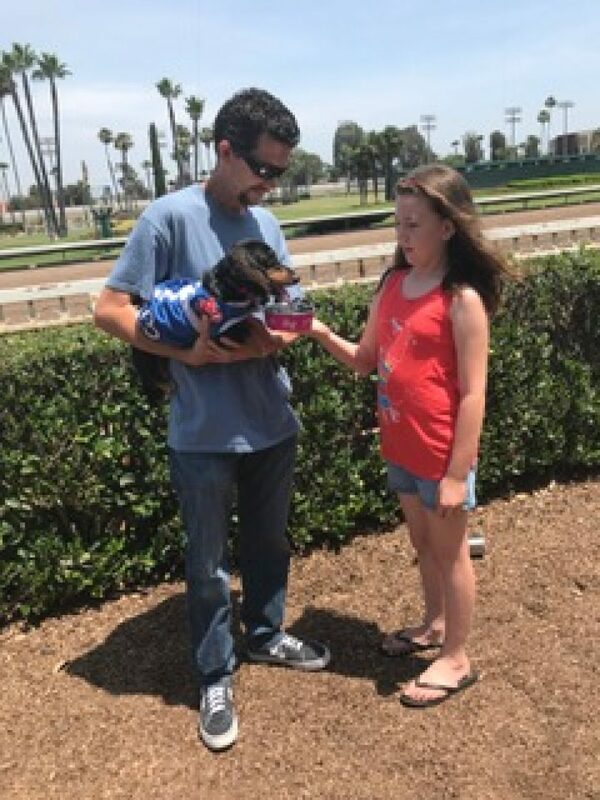 For the past 22 years, cooing and oohing fans have packed the Los Alamitos Race Course for the annual Wienerschnitzel Wiener Nationals, sponsored by the eponymous—or perhaps epuppymous—hot-dog chain. 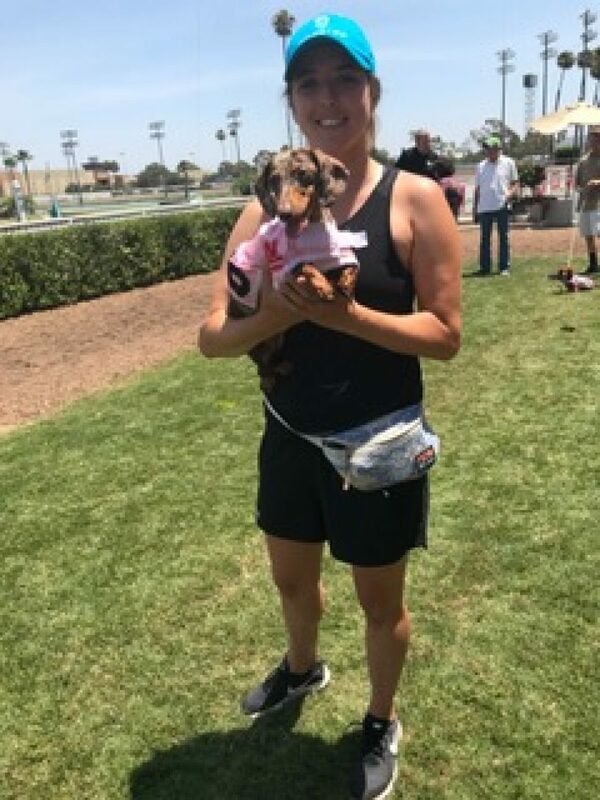 In its 23rd season at Los Al, officials expect the house to be packed again to cheer on the nearly 90 little-legged sausages from up and down the California coast and inland to the Mohave. There’s even a rascal from Reno. Two little Long Beach girls are contenders: Bella Evans, aka Scoopski, and Poppy Denny. Both dachshunds came with their human companions/trainers to work out at the practice runs on Monday, July 16. Bella did pretty well at the trials. The little dog had joined the Evans family a few months ago when she was snuck in under the pretense of being a Rottweiler puppy. If Bella does win the championship heat, she’ll take home a trophy, a blankie and $1,000, which will buy a lot of kibble and squeaky toys. It’s all donated by the Los Alamitos Race Course. She’ll get her own little condo, too–a new doghouse donated by Wienerschnitzel. There will be eight of the little racers in each of the 10 heats. 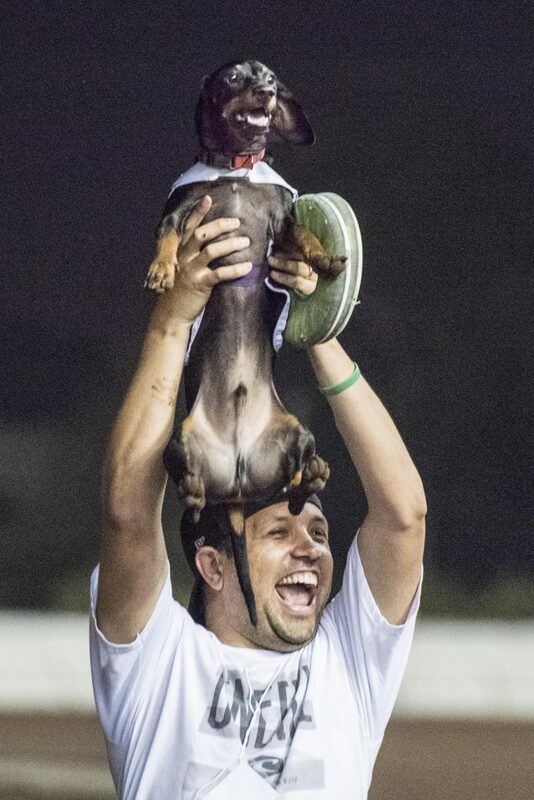 The 2017 Wiener Nationals champion, Baby Bo, a 2 ½-year-old black-and-tan challenger, will be racing again this year. He’ll be in the fourth heat and is apparently the one to beat. Baby Bo gets help standing tall from his human, Eddie Kirschner. Photo courtesy of Los Alamitos Race Course. “He’s big and strong, so we’ll see if anyone can beat him!” Gutierrez said. Poppy Denny seemed to take the whole thing in stride, as far as a dachshund can stride, anyway. “We’re in it to win it,” said her mom, Shaina. Like Bella, it’s Poppy’s first time at Los Al but not her first gig as a racer. She competed at 6 months old at another meet at Old World Huntington Beach and did well, according to Shaina. “She was lightweight and small compared to some of the stronger dogs, but she held her own,” Shaina said. Poppy Denny’s routine involves a lot of runs, a lot of walks, and following Shaina on her bike in a safe location. Poppy Denny, with Shaina–in it to win it! Photo by Kate Karp. 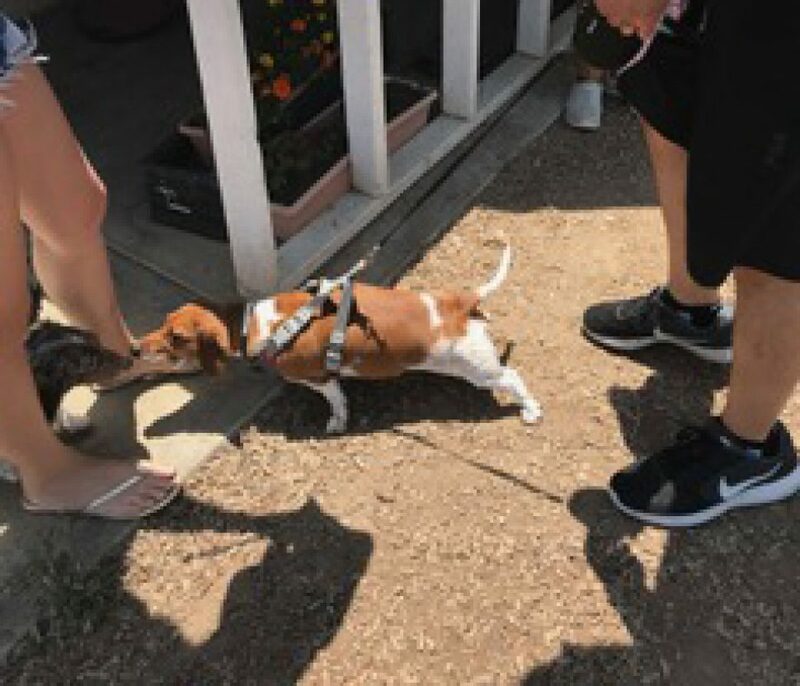 No matter which little shnookums is declared Fastest Wiener in the West, the real winners will be the cats and dogs at Seal Beach Animal Care Center. SBACC’s animal shelter keeps pets until they can find them a home, and it costs some money. Last year’s event raised $18,000 through ticket sales and T-shirt sales on the day of the event, adding to the more than $250,000 that the Wiener Nationals have raised for the Care Center. Of course, you’ll want to come, too, for every leg of the race, as short as the legs may be. The races start at 6:30PM, with the championship heat at 9:30PM. Get there early, as seating is first come, first served. Parking is free; you can buy your ticket on the day of the event for only $3.00, and if you’re 17 or younger, you get in for free! For safety reasons, leave your dogs home, even if they’re wieners. And down the stretch they come, every little adorable, stretchy snuggler! 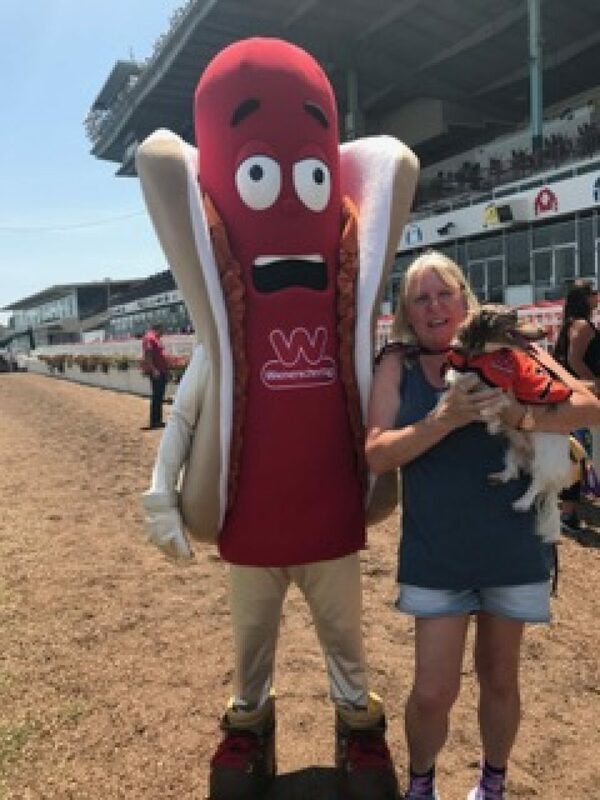 The 23rd annual Wienerschnitzel Wiener Nationals take place Saturday, July 20 starting at 6:30 p.m. at the Los Alamitos Race Course, 4961 Katella Ave in Cypress.